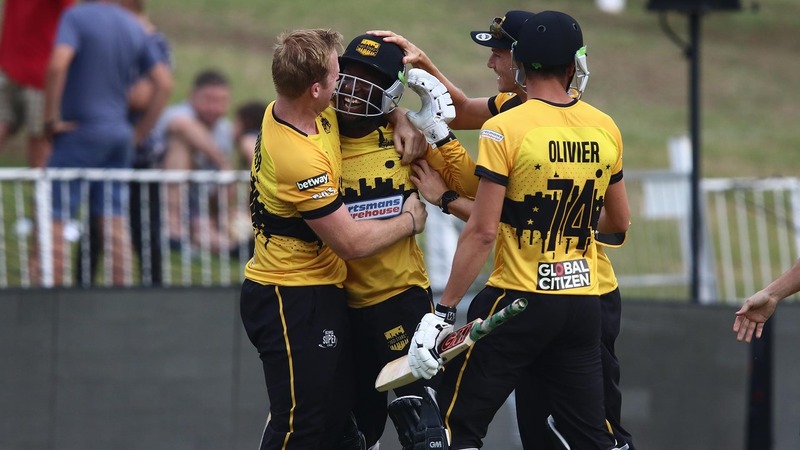 Nono Pongolo was the unlikely hero for the Jozi Stars with the bowling all-rounder smashing two sixes in the final over to edge his team over the line by one wicket in a thriller at Kingsmead. The Stars had made heavy weather of their run chase after earlier dismissing the Durban Heat for just 128. They visitors seemed entirely out of the contest when they were left requiring 12 runs off the final two balls of Marchant de Lange’s last over. But that is when De Lange lost his radar. The former Standard Bank Proteas seamer delivered two waist high full tosses in succession, with both deliveries called no-ball. To rub further salt into the Heat’s wounds, Pongolo smashed both balls high into the stands to send his team into a state of delirium. It was the most unlikely victory after the Stars had been reduced to 58/6 due to some excellent bowling from Rasheed Khan (3/19) and some comical running between the wickets before captain Dane Vilas (43 off 36 balls) and Simon Harmer (25 off 22 balls) resurrected the Stars innings with a 48-run partnership for the seventh wicket. Earlier, Sarel Erwee (62 off 39 balls) had kept the Heat innings afloat with a half-century. The left-hand opening batsman only had support from his skipper Albie Morkel (29 off 29 balls) as the home team’s struggles with the bat continued. Standard Bank Proteas seamer Kagiso Rabada was the most impressive bowler for Jozi Stars with the fast bowler closing off the innings with figures of 3/29. There were also two wickets apiece for Duanne Olivier (2/25), Dan Christian (2/25) and Harmer (2/20). Their good work was almost undone though when Jozi Stars premier run-getters Chris Gayle (5) and Reeza Hendricks (8) failed to get out the blocks, but Pongolo ensured the bowlers’ efforts would not be in vain.